Last week we told readers about a special Facebook event for the media due to take place on Tuesday January 15th and there was plenty of speculation concerning what the event would be about. Among other things our thoughts turned to a possible Facebook Phone announcement and Facebook hasn’t given much away with the invitations simply saying, “Come and see what we’re building.” While plenty of tech enthusiasts still hope to see news of a phone it seems conjecture is also moving towards a new search engine. The time of the Facebook event kicks off at 10am PT, that’s 1pm ET or if you’re in the UK 6pm, so there’s just a few more hours to go before we find out for sure. When we previously discussed what the focus of the event may be we mentioned a new Facebook service or software, something connected to Poke (the new short-messaging and photo service that was recently announced, or perhaps more news on Instagram. Thoughts also turned to a Facebook phone that has been rumored for so long we’ve almost given up on it. Whether you think the idea of a Facebook phone is a good one or not, it would be interesting at last to see something more concrete about it. Now it seems that some analysts who have been pondering on the subject of the event feel it’s more likely that we’ll see the introduction of a brand new search engine that could utilize Facebook information and be a rival to the giant Google search engine. Another possibility that has been raised is additional advertising tools and products aimed at personalized messages to Facebook users and that could gauge the effectiveness of this approach. This would be focused primarily on mobile device advertising. Facebook CEO Mark Zuckerberg has previously said that the mobile platform is now a priority. This seems wise considering that most of the 1 billion active Facebook users mainly use smartphones and tablets to access the social network, according to recent research. Facebook stock has risen in recent months after new advertising products were introduced and since this year began shares have risen above $30 according to Mercury News. After today’s event was announced there was an initial surge but then yesterday stock dropped by almost 2.5%, with some investors selling, cautious about what the event would bring. Arvind Bhatia, financial analyst with Sterne Agee and speaking about Facebook said, “The more they can keep you engaged on their site, the more that’s good for their advertising.” There’s no doubt that a new search engine that could utilize both web information and recommendations from friends would keep people on Facebook for longer and also be beneficial for Facebook users. It won’t be too much longer now until we find out for sure what the Facebook event is all about and in the meanwhile we’d really like to hear thoughts from our readers about this. 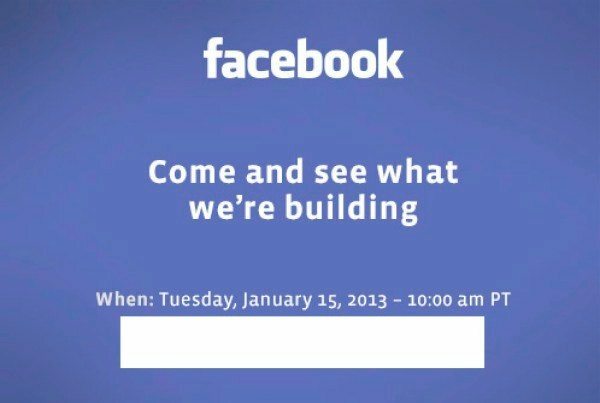 Are you hoping to see a Facebook phone announced later today? Maybe you are intrigued with the idea of a Facebook search engine? Send us your comments on this.